We all know how easy it is to spend money. Saving can tricky, we have outgoings that are sometimes more than we earn. It’s a brand new year and what a better start than to put together some tips to help save money in 2018. Try out these easy ways to help you save money. Don’t be afraid to see how much you actually have available. Remember ignoring the reality will only mean you spend more, not less. Force yourself to look every time you get cash out until it doesn’t seem scary any more. Take advantage of your banks apps so you can check your balance on the go! This will also help stop any impulse buys if you know exactly how much you have to spend. When you shop using cashback websites, you can earn a percentage (usually 1%-15%) of what you spend back. Get into the habit of using cashback websites every time you buy something online. I personally use Quidco but there’s many others available like TopCashback. Infact, as a bonus, if you join Quidco and earn £5 in cashback, you’ll earn an extra £5 from my referral! Overall cashback sites may not be a bank breaking amount, but it gave me an extra boost at Christmas as I tend to cash out in December. Try out generic brands of some of your most common items. Depending on what you buy, it’s sometimes it’s hard to notice a difference. Medicines, food, toiletries – why not try a less popular brand, it’ll be cheaper and you might not notice much difference. We sometimes get fooled by packaging and sucked into thinking the better it looks on the outside, the better the quality. If you read the labels and check ingredients, you’ll sometimes find it’s the exact same product. Buy personal care items, such as deodorant and toothpaste, in bulk. Buying bulk almost always saves money on the unit price but don’t be fooled into 3 for 2 offers unless it’s something you’re actually going to use before the use by date. One of the easiest ways to save money is to only shop when you have a list. Without one you’ll end up making impulse buys and unplanned purchases. Having a food shopping list is probably the most important. Not only can it help you buy items that fit with your meal plan, but it can also help you avoid buying food you might waste. Remember to always create a list and,stick to it. Whether it’s on your phone or hand written, be prepared. I personally prefer to handwrite my lists and keep it on my fridge! This magnetic shopping list is my go to. Spending because you’re stressed is rarely a good idea. It’s easy to justify spending money just to wind down from a stressful day at work. Instead of buying things you don’t need to make yourself feel better – find other ways to de-stress instead. Exercise, TV, wine, whatever your go to relaxation method is – do it instead of spending! Remember, spending money won’t reduce your stress in the long run. If you pay with cash, why not save the change you’re given. Pounds and dollars can add up. Save your change and only empty your jar once every 6 months or once a year, You’ll be surprised how much you easily managed to put away! I use a good-ole fashioned piggy bank/money box. That way there’s no emptying after a few days. Although it’s hard to save, even an extra 20 pounds can make a difference. 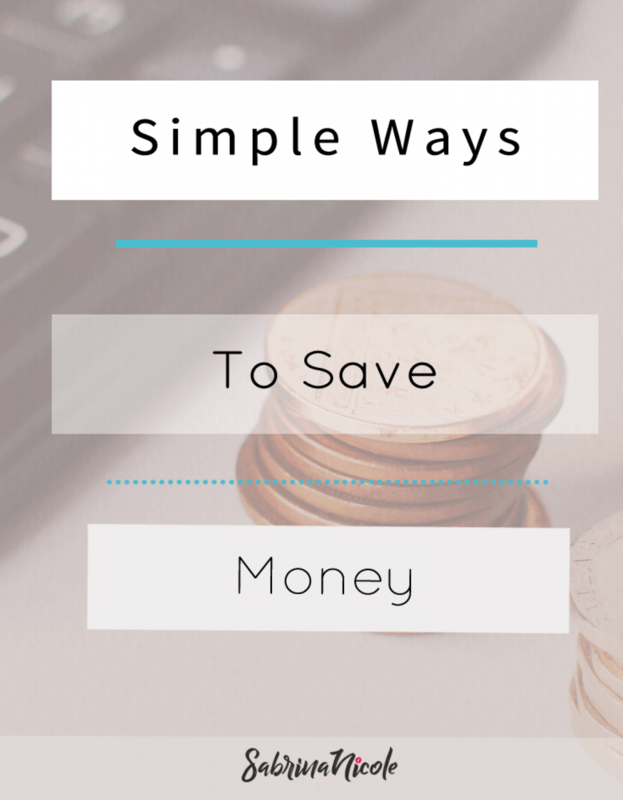 Some of the best money saving tips are simple and can be easy to start right away! Remember, you could get an extra £5 from me by joining and using Quidco! So there you have it, Simple Ways To Save Money! Do you have any other tips to try?